Units are also custom made to accommodate clients own requests or needs . We eliminate normal day-to-day diesel theft by fitting designed, logical and field-tested equipment, with the sole mission to truly reduce fuel theft. We have developed a range of products that have no equivalent in the market. We address the whole fuel system – from cap, pick-up, sump plug and fuel lines. By effectively addressing this with patented innovations, we stop daily fuel theft. No wonder we are the national standard for various large fleets, mining and construction companies. 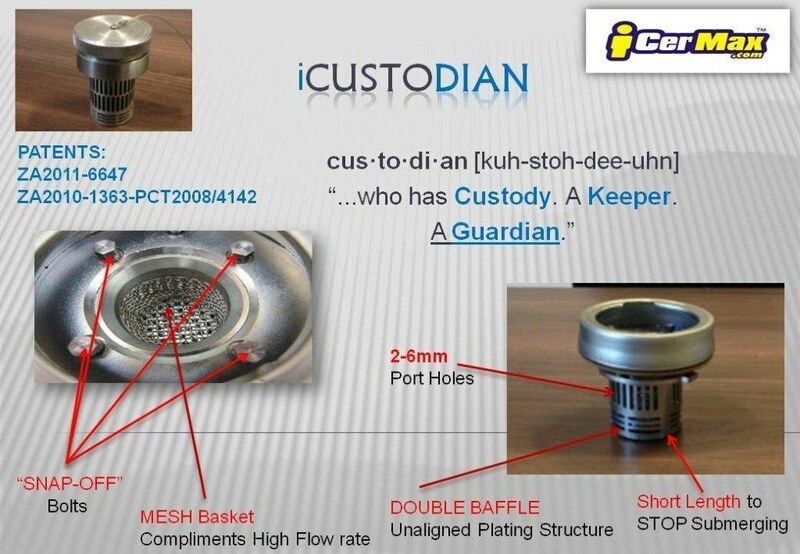 Patented internal Stainless Steel Mesh for improved Flow Rate and Secure Prevention to fuel access. Short or long units - Short units limit access to the fuel at the top of the tank. 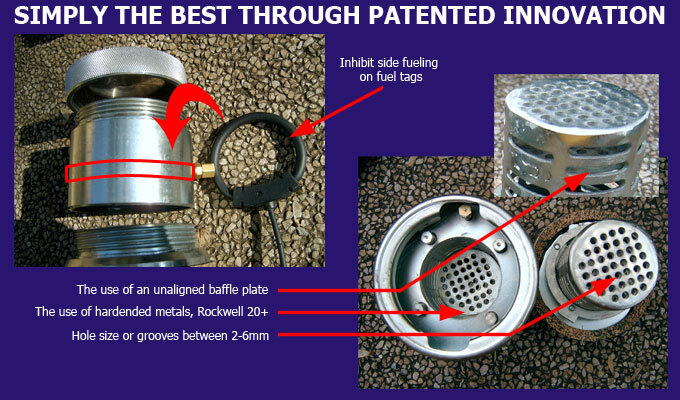 Patented - Baffle plate, side fuelling, 20 Rockwell Plus hardness (Domex), 2-6 mm holes, stainless steel mesh wire insert. iCerMax Devices - Why quality and functionality is more important than price. "Simply the best" and most effective device to prevent fuel theft, developed over the years in Africa. As fuel theft is not a new phenomenon, as in other countries. Un equivalent protection to fuel access - Superior design and functionality. NEW Short unit - prevent access to fuel inside device (see below), less than 10 mm to the top of tank. Internal stainless steel mesh wire -to provide excellent flow rates and superior access protection. Unaligned baffle plates - tigh welded for physical strength. Small narrow slots - prevent access as thieves will steal fuel, through a single 5mm round hole. Easy snap-off bolt installation, but removal only through physical drilling. Physically manufactured for strength and functionality. "Simply the best" device in the market, that saves money. The use of hardened metals (Domex or Armour plates) with a baffle plate is the only effective way to stop innovative thieves from gasoline theft. Where there is no space constraints, we fit “the Custodian “custom devices externally for total effective control and diesel conservation. They even work cross border into Africa. iCerMax manufactures devices to prevent fuel theft from all makes of trucks large or small, bakkies, yellow goods, construction equipment, tractors, generators & fuel main bulk tanks - in short, anything that uses fuel. We custom manufacture to you and your equipment ‘s requirements, based on material, length, grooves or holes and fitment method. We have years of experience and do fitment to large national fleets. We have over the years developed a holistic approach to hinder fuel theft. Therefore we address all access points to fuel -not just the fuel cap. The physical protection of fuel is vital as fuel is an escalating material operational cost, therefore the installation of anti siphoning devices that “work” is crucial. Buying inferior devices or simply buying on price, is the most costly, as the fuel is not protected from theft. STANDARD DIESEL CAP IVECO, RENAULT. Back plates can be modified perfect for CAT. Drain plugs size 1 to 5 Snap off - sump plugs (various sizes), custom tool units are simply opened by drivers, with their own "Custom Tool"
CE-090 bowser Anti-siphon-farm tants, mobile fuel 3"
CE-091 adaptor plate 3" to 2"
Below is a diesel thieves best frends, he can steal to daily limits. With the Custodian™ it is totally impossible to access the fuel without physically attacking the robust device itself, thanks to our patented baffle plate and 2-6 mm hole sizes. Stainless steel wire mesh inserts prevent all access to the fuel and traps large contamination particles preventing them from entering the fuel tank. Excellent Flow rates. Limits access to FUEL in top of tanks with the New SHORT Custodian™, whilst still having excellent flow rate. Our patented internal stainless steel mesh insert enhances protection of access to the fuel with our patented double UN aligned baffle plates and 2-6mm small hole sizes. Prevents deep access into the tank - Short unit. Baffle plate unaligned, Internal Mesh, 2-6 mm holes/groves, snap off bolts - fitment is easy and 100% secure - you have physically to drill the unit out. OUR devices prevent fuel theft from all makes of trucks -large or small, bakkies, yellow goods, construction equipment, tractors, generators & fuel main bulk tanks - in short, anything that uses fuel. We custom manufacture to your and your equipment's requirements, based on material use, unit length, grooves or holes and fitment method. We have years of experience and do fitment to large national fleets. Eliminate normal day-to-day diesel theft by fitting well designed, logical and field-tested equipment, with the sole mission to truly reduce fuel theft. We have developed a range of products that have no equivalent in the market. By effectively addressing the problem with patented innovations we stop daily fuel theft. No wonder we are the national standard for various large fleets, mining and construction companies. The physical protection of fuel is vital as fuel is an escalating material operational cost, therefore the installation of anti-siphon devices that “work” is crucial. Buying inferior devices or simply buying on price is the most costly, as the fuel is not protected from theft. Our device is the ultimate in fuel protection . We eliminate normal day-to-day diesel theft by fitting well designed, logical and field tested equipment, with the sole mission to truly reduce fuel theft. We have developed a range of products that have no equivalent in the market. Our devices protect even against the smallest tubes or pipes, whilst still maintaining excellent Flow rates and offer five different secure fitment options. Caution: buying an anti -siphon device purely based on price is a costly mistake. The difference between effective design, quality materials and construction and a “cheap device “is only a few litres of fuel easily lost in one month. The device has to protect access to the fuel and ensure longevity. Fuel is an ever rising commodity and therefore requires effective protection. We are the most effective and that is what saves money. bowl, especially with our red floating indicator.